With nearly 400 stores across five countries, we're a one-stop source for domestic, international, and freight shipping services. When you visit your local Pak Mail in Spring Lake, we'll find the most cost-effective, safe way to pack and ship your items, whether it's by air, ocean, or ground. Pak Mail Spring Lake is happy to announce that the Holiday shipping season started in earnest yesterday! Come in and beat the rush. We will be happy to serve you. Welcome to Pak Mail Spring Lake! Pak Mail Spring Lake is your One Stop Ship Shop™ – a complete and comprehensive packing and shipping store. When you ship with us, you'll have the opportunity to compare our negotiated rates from our preferred network of carriers (DHL, FedEx, UPS, USPS, and more) and numerous shipping options to provide you with a reliable and efficient delivery method. Select from the top carriers to ensure safe and secure delivery each and every time. Whether you need to ship furniture, electronic equipment, care packages or artwork. Want the best value for small package shipping? Need something sent via overnight shipping? Have an internet order drop-off or amazon.com return? Need packing and shipping supplies? We help our customers do everything from sticking a stamp on a letter, to packing and shipping delicate crystal, to crating auto parts heading overseas. 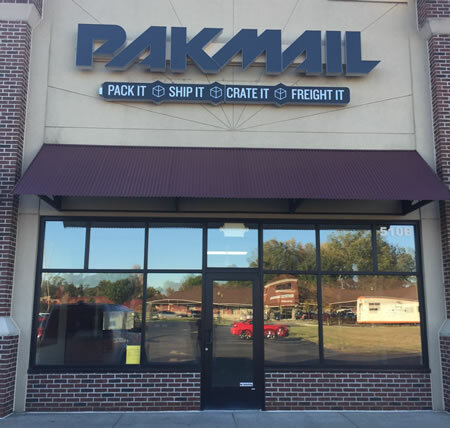 Pak Mail Spring Lake is owned and operated by a Spring Lake/Grand Haven area family and is a full service packing and shipping store. And we can handle custom crating and freight shipping needs as well. Conveniently located on M-104/W. Savidge, just west of the Wesco Gas Station and next to Biggby Coffee with reserved, easy drop-off parking - we proudly serve Spring Lake, Grand Haven and all surrounding cities. Request a Free Online Estimate or call us at 616-935-7712.